There is usually one decoration that escapes notice during the process of taking down and putting away, at least in my house. Its presence is noted only after all the boxes have been safely stowed in the attic. Last year it was a purple, handmade, sequined ornament with a gold bow, made by a woman whose family walked through trauma in God’s strength. It hangs in a special place, during Christmas, symbolic of answered prayers. 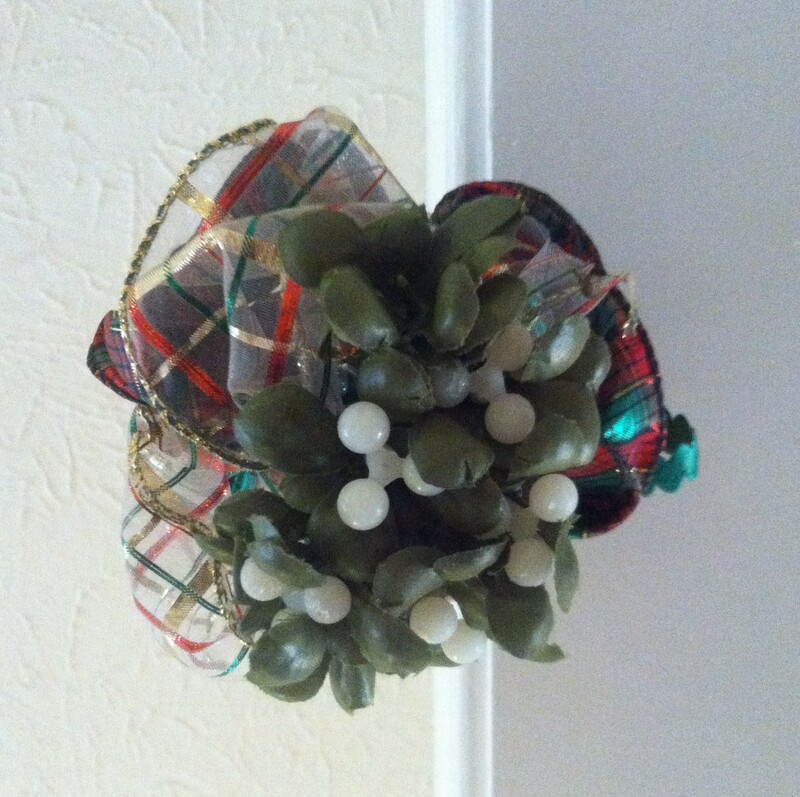 This time, a sprig of fake mistletoe escaped the take down. Every year, it swings from the door frame between the kitchen and the living room; reminding me of a sweet Christmas, years ago, when it hung from the doorway of a backpacking tent, placed there by the man who would one day ask me to marry him. The afterglow of courtship still clings in my memory to that slightly tattered bunch of silk leaves and plastic berries. I love the memories, but appreciate more, the years since, when married life brought shared joys, sorrows, laughter, commitment and comfort. The afterglow endured and took on a life of its own. There are so many moments in all of our lives that leave luminous fragments as they pass: courtship and wedding days, the births of precious children, special family times and holidays celebrated. It’s lovely and warm to bask in the afterglow, but what you do afterward makes up the substance of life. However, it is easy to imagine that the days following Mary’s encounter with the angel were tumultuous. Telling Joseph that she was with child, clearly not his, and explaining her situation to her family must have been difficult, to say the least. Were the family dynamics following her revelation tear-infused as her loved ones tried to embrace the news and deal with the consequences of a potentially broken engagement, legal ramifications of a divorce and community gossip? We can only speculate about the details, and recognize that God, in His infinite wisdom, knew character development, reliance on Him and strength of faith would come from any hardship Mary and Joseph endured. Mary followed the path God set for her, but it didn’t end in Bethlehem. The steps of her life took her all the way to the cross, where she watched her son be crucified. Did she stand there as the darkness gathered, wishing that it was she who suffered, instead of her precious boy, knowing in her soul that it could not be? All the details, the uttered prophecies and amazing circumstance surrounding her son’s life, treasured in her heart, must have resonated in her mind, mixed with sharp, stabbing anguish. One can only hope that there was Godly insight there as well, knowledge that the horror she witnessed was meant to be and that glory would come, not as an afterglow, but as a brilliant light, exploding salvation into the world. Mary gave substance to her life by following God’s will, and offered us a beautiful example of what that looks like. She trusted God and humbly accepted His plan for her life, whatever that entailed. Although she experienced the heart ache of a soul pierced with grief (Luke 2:25-35), she knew soul-seated joy (Luke 1:46-55) and had the privilege of delivering the favor of God’s grace to the world through the instrument of her body: giving birth to the Son of God, Redeemer of the lost. Once the ornaments are all packed away, how should we walk in the afterglow of Christmas? Do only the memories linger, or does the afterglow take on a life and light of its own; a glowing commitment to share Jesus, the gift of God’s grace, all year, through the instrument of our bodies: our words, our actions, and our lives? The journey of a Christ follower is not promised to be trouble-free, and speaking the message of salvation is often not easy. But, if you are a child of God, you, like Mary, are favored. You have been given His saving grace! It is your privilege to deliver the news of God’s gift, and His Spirit will strengthen you to walk the path He wants you to follow. To summarize all that we have considered since September 6, following Jesus means to have an intentional and dedicated focus to living the will of God and developing His character in the process. The trials and sacrifices incurred are tools God uses to shape us into an image of His Son. The presence of the Lord with us and the promise of eternity with Him gives a soul-seated joy that circumstances can’t take away. Following Him and delivering that message can take you many different directions. Perhaps it takes you to a mission field, faraway. Maybe the path is one you walk within your family, striving to follow God’s ways, not the world’s; guiding your children and family members to Christ. Maybe the trail takes you across the rocky fields of a workplace where God’s presence isn’t wanted, a classroom where prayer is not allowed, or to the many arenas where the world’s presence is dominate and darkness abounds. We are called to shine our light, the in-dwelling of the Holy Spirit, so others believe that Jesus is the Way, the Truth and the Life; (John 14:6) and will then praise God for the illumination of their minds and salvation of their souls. We can all learn from Mary, who picked up her cross, and followed the Lord, long before the Son she bore spoke the words in Matthew 16:24 to His disciples. In the afterglow of Christmas, remember that you are God’s masterpiece, (Ephesians 2:10) a uniquely crafted instrument, meant to sound out the beauty of God’s grace: Salvation through Jesus Christ. If you have not yet internalized belief in Jesus, Redeemer of your soul, know that He is calling you and longing for a relationship with you. Admit you have sinned. Believe that God’s Son died for you. Confess your sins to Him. With open hands, accept the best Christmas gift ever, that can come on any day: eternal life and the presence of the Holy Spirit in you, guaranteeing you Forever Life. Prayer: Holy Father: Help me walk in the afterglow of Christmas. Make the spirit of Christmas blaze with a light of its own, so that I can shine the light of your Son into the darkness, and follow you wherever your will takes me. Develop in me your character as I share your grace and follow you, amen. My hope and prayer for all of you: May the Lord bless you with the light of His Son, igniting in you a passion to follow Him. When you pack the visual reminders of Christmas away, keep the meaning of Christmas in your life, so that the afterglow endures and takes on a life of its own. Love more, serve more, speak more for Him!